You can view the details of an item in the Details Panel. The Details Panel is located below the item's list in the tabs. In a product tab (i.e. horizon, polygon, probe, etc), click to select an item. 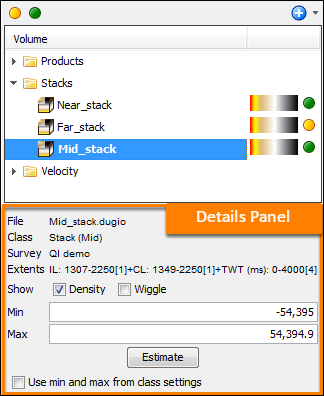 This will display the Details Panel of the selected item. 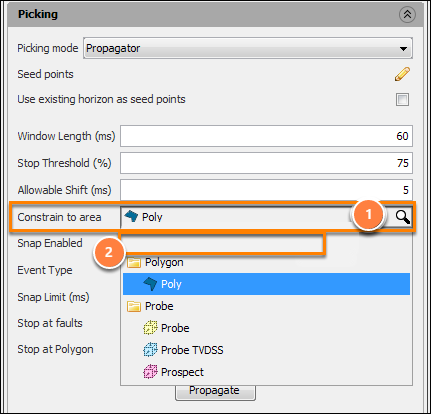 In this example, we are selecting a polygon or probe in the Details Panel of a horizon to constrain the area that will be propagated. Click on the magnifying glass icon to display a list of available polygons and probes. Then, click on the desired polygon or probe to select it. To deselect the item, or to leave the field empty, select the blank option at the top of the list. If the list is very long, a search bar will be available to filter the results.